Who willingly walks into a haunted house? Ghost hunting isn’t something that most people think of as a career, but there are people out there who solicit these types of services legitimately. They’re not just the stuff of horror fiction and films any longer, as attested by ghost hunter Jaeson K. Jrakman in his introduction. Daniel Defoe even wrote a book on the subject called The Secrets of the Invisible World Disclos’d in 1735. Still, whether the stories are true or made up, they make for great entertainment, and Haunted: 11 Tales of Ghostly Horror is no exception. With the sheer number of ghost hunting shows that are littering the television landscape these days, not to mention in the movies, its nearly impossible for this book not to exist. It was only a matter of time. That being said, there is no doubt a need for a book like this in the market. While not a die hard Ghostbuster myself, the genre is part of my chosen areas of speciality. Also, as it was produced by a local small publisher and had several of my favorite authors – several of which were local – the choice for me to pick it up was an easy one. “Haunted”, the debut anthology of FR Press, delivers an excellently paced collection of mysterious and terrifying tales. The collection focuses on stories about hauntings and the ghost hunters that investigate them. All eleven stories in “Haunted” possess their own merits, and are distinct enough that the anthology avoids the pitfall of having eleven different stories trying to do the same thing. Typically I am not a fan of anthologies. Usually when I set aside time to read I want to be able to delve into a novel and lose myself for a few hours. The constant shifting of gears and restarting that occurs as you move from story to story in an anthology always makes me feel tossed about. “Haunted” however, has avoided (or the very least minimized) this problem for me. The eleven stories in the collection are laid out in such a way that it feels like you are traveling through an entire pot arc, not just eleven short, disparate plots. Given that I have spent the last two years gorging on post apocalyptic books I thought it was time for a break and so I chose to read Haunted: 11 tales, these tales all infer a connection to Ghost Hunting. Many of us have seen this on TV and normally revolve around a few guys with tattoos jumping at the sign of moth; I was interested to see what writers would do with the genre. I have to say I was very pleasantly surprised; this is a great anthology by a group of writers which were largely unknown to me before and I will certainly be buying books from some of the contributors. The whole anthology flows really well with no real repetition. We also just found out that Haunted: 11 Tales of Ghostly Horror won the Best Anthology category in the Preditors & Editors Readers’ Poll. 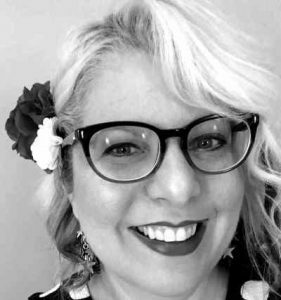 The P&E Readers’ Poll is an annual event hosted by the Critters Writers Workshop where readers and fans can vote on their favorite books, authors and publishers. Thanks to our readers we took the top spot in this year’s event and we’re honored that so many would vote for our little collection of horror. 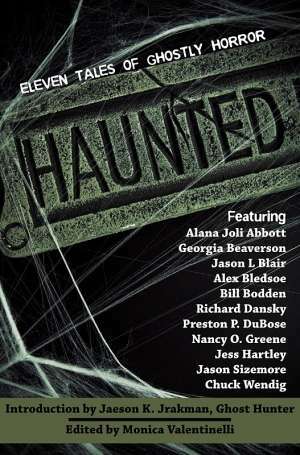 Haunted: 11 Tales of Ghostly Horror is available in eBook (PDF, ePub and Mobi/Kindle) and Print formats at DriveThruFiction.com. It is also available at the B&N Nook Store.